Categories: For Kids, Puzzles, Arcade, Entertainment, Family, Trivia. Engage and attract a younger audience (parents and teachers too!) to your site with fun games while helping them learn in a safe environment. 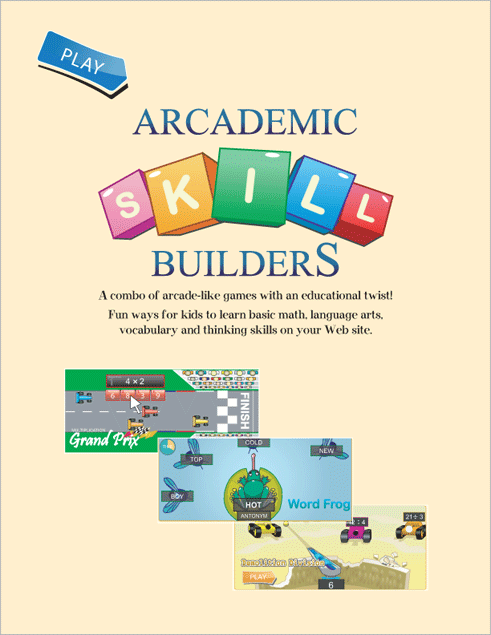 These online educational video games teach basic academic skills by incorporating features of arcade games, making them fun for kids to play. The 11 multi-player games and 12 single-player games (focusing on math and language arts skills) are designed to help children retain knowledge, maintain performance levels and apply what they have learned in new situations. Multi-player games do not allow for contact between outside players, and player IDs are not stored. Games are hosted within your navigation and ad code and can be purchased individually or as a package. Games can be played on any browser with Flash (IE, Netscape, Firefox and even the Nintendo Wiiâ„¢) Promotional material is provided with graphic icons and flash ads that can be co-branded for your site. â€œAnyone whoâ€™s witnessed a child playing a video game has seen the intense focus and commitment to breaking through to the next level or beating a previous score. Aligning the joy of gaming with something tedious like practicing math facts clearly helps transform the experience and invites students to learn in an environment they are not only comfortable with but would seek out given the choice. â€œAfter introducing my first grade students to the Jet Ski Addition game at Arcademic, many recounted how they continued using the site for up to 2 hours on a Saturday to continue playing the game. What does that mean? That means that on a Saturday, first graders practiced their addition facts for 2 hours at home without anyone making them do it. In all my years of teaching, Iâ€™ve never heard of such a thing!